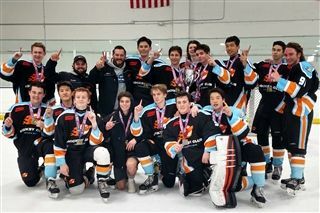 The Varsity and JV Pacific Ridge Hockey clubs both won their respective divisions in International Hockey Events on February 19. JV played first and beat California Wave 5-1. Varsity came out after and won 5-0 over Santa Margarita. "Our teams really came together to rally for our seniors and one another," Coach Juan Trevino said. Seniors Isaiah Granet, Derek McInerney and Aden Dinning had a great game while freshmen players including Jack Cadieux, Hayden Shoemake and goalie Connor Hughes ensured a JV win. Go Firebirds!